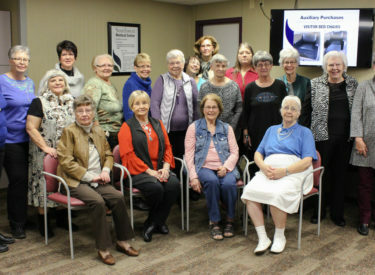 Southwest Medical Center Auxiliary volunteers recognized 41 members for more than 108,200 combined hours of service to the hospital and Liberal community during an awards ceremony Thursday at Southwest Medical Center. Award recipients were presented by Auxiliary President, Linda Staiger, as follows: 50 hours – Phyllis Glunt, Elaine Schooley; 100 hours – Carol Dearing, Ann McMurphy, Charlene Plett; 400 hours – Pam Dorris; 500 hours – Diane Heiers, Linda McCullough; 600 hours – Aleta Arnold, Don Devinney, Susan James, Shawne Padilla; 700 hours – Marian McCaulley, Ginny McNitt, Jill Pittman; 800 hours – Bob Oblander; 900 hours –Mickey Durbin, Juneil McQueen; 1,000 hours – Connie Richmeier; 1,100 hours – Jane Devinney, Sue Farmer; 1,400 hours – Mary Amerin, Barbara Hanson; 1,600 hours – Katie Berg; 1,800 hours – Velma Colter; 2,100 hours – Eula Kittle, Judy Shelman, Marilyn Thompson; 2,300 hours – Alice Hill; 3,200 hours – Cheryl Carson; 3,500 hours – Jonice Oblander; 4,000 hours – Mary Downs; 4,800 hours – Aneta Compton; 5,500 hours – Sharon Garcia, Saundra Koochel; 5,800 hours – Linda Staiger; 7,600 hours – Connie McPhail; 8,400 hours – Jana Widener; 10,000 hours – Susan Zielke; 23,000 hours – Marylin Headrick; honorable mentions – Doris Goddard, Keeley Moree, Rachel Downing; and “Too Many to Count” – Kay Hay. Southwest Medical Center President & CEO, Bill Ermann, thanked volunteers for their continued efforts in serving the patients and families who visit Southwest Medical Center, as well raising funds for special purchases in the hospital through work in the Auxiliary’s gift shop and snack bar. The Auxiliary also introduced and installed the 2019 Auxiliary Board members. These members include: Connie McPhail, President; Jo Harrison, 1st Vice-President; Juneil McQueen, Secretary; and Jana Widener, Treasurer. The Southwest Medical Center Auxiliary welcomes volunteers of all ages to become involved in serving Southwest Medical Center. The annual membership fee for the Auxiliary is $10, which is applied towards medical scholarships. Those interested in becoming a member can contact the SWMC Gift Shop at (620) 629-6899 for more information.